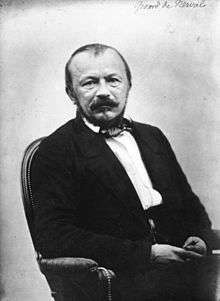 Gérard de Nerval (French: [ʒeʁaʁ də nɛʁval]; 22 May 1808 – 26 January 1855) was the nom-de-plume of the French writer, poet, essayist and translator Gérard Labrunie. A major figure of French romanticism who worked in many genres, he is best known for his poems and novellas, especially the collection Les Filles du feu (The Daughters of Fire), which includes the novella Sylvie and the poem El Desdichado. Gérard Labrunie was born in Paris on 22 May 1808. His mother, Marie-Antoinette Laurent, was the daughter of a clothing salesman. Gérard's father, Étienne Labrunie, a military doctor, was given a formal position in Napoleon's Grande Armée. When he joined the campaign in Prussia, his wife followed him. On 29 November 1810, when Gérard was two years old, Marie-Antoinette died by her husband's side in Głogów. He was brought up by his maternal great-uncle, Antoine Boucher, in the countryside of Valois at Mortefontaine. On his father's return from war in 1814, Nerval was sent back to Paris. He frequently returned to the countryside of Valois during holidays, and he returned to it in imagination later in his Chansons et légendes du Valois. In 1822 Gérard began classes at the collège Charlemagne alongside Théophile Gautier, who became a lifelong friend. His second year at Charlemagne (1822/23) is when he tried writing for the first time, compiling his first manuscript, a one-hundred and forty page manuscript. One poem of his, in praise of Napoleon, Napoléon ou la France guerrière, élégies nationales, was published under the name Gérard L.
His prose translation of Goethe's Faust, published in 1828, established his reputation. Goethe himself read Nerval's translation and called it "very successful," even claiming that he preferred it to the original. Hector Berlioz relied on Nerval's translation for his work La damnation de Faust. In 1829, having received his baccalaureate degree and under pressure from his father to find himself a profession, he took up a position at a notary's office. But he kept his heart set on literature. When Victor Hugo asked him to support his play Hernani, under attack from conservative critics suspicious of Romanticism, Gérard was more than happy to join the fight (See fr:Bataille d'Hernani). Though an eager participant in this so-called Romantic revolution, Gérard was largely indifferent to the July Revolution that also took place in 1830. Instead, Gérard set himself two anthology projects: one on German poetry, and one on French poetry. Alexandre Dumas and Pierre-Sébastien Laurentie arranged a library card for him so he could carry out his research. The first anthology included translations of Klopstock, Schiller, Bürger, and Goethe, and met with less enthusiasm than his translation of Faust. The second anthology included poems by Ronsard, Joachim du Bellay, Jean-Antoine de Baïf, Guillaume du Bartas, and Jean-Baptiste Chassignet. By the fall of 1830, the Cénacle, a group created by Sainte-Beuve to ensure Victor Hugo's success with Hernani, had assembled many famed writers, including Alfred de Vigny, Alfred de Musset, Charles Nodier, Alexandre Dumas, and Honoré de Balzac. After Hernani's success, the Cénacle began to fall apart. At that time a new group appeared: the Petit-Cénacle, created by the sculptor Jean Bernard Duseigneur. Gérard attends some of the meetings, which took place in Duseigneur's studio. Gérard, following Hugo's lead, started to write plays. Le Prince des sots and Lara ou l'expiation were shown at the Théâtre de l'Odéon and met with positive reviews. He started to use the pseudonym Gérard de Nerval, inspired by the name of a property near Loisy (a village near Ver-sur-Launette, Oise) which had belonged to his family. In January 1834, Nerval's maternal grandfather died and he inherited around 30,000 francs. That fall, he headed to Southern France, then traveled to Florence, Rome and Naples. On his return in 1835, he moved in with a group of Romantic artists (including Camille Rogier) at impasse du Doyenné. In May of that year, he created Le Monde Dramatique, a luxurious literary journal that made him squander his inheritance. Debt-ridden, Gérard finally sold it in 1836. Getting his start in journalism, he traveled to Belgium with Gautier from July to September. In 1837, Piquillo was shown at the Opéra-Comique. Despite Nerval's work on the project, Dumas' was the only name on the libretto. Jenny Colon played the main role. Nerval may have fallen in love with the actress. Some specialists claim that his unrequited love for her is what inspired many of the female figures that appear in his writing, including the Virgin Mary, Isis, the queen of Saba. Other experts disagree with this biographical analysis. Despite Dumas' refusal to let him take credit for his work, Nerval continued to collaborate with Dumas on plays. In the summer of 1838, he traveled with Dumas to Germany to work on Léo Burckart, which eventually premiered at the Théâtre de la Porte-Saint-Martin on 16 April 1839, six days after the premiere of another play the pair worked on together called L'Alchimiste. In November 1839, Nerval traveled to Vienna, where he met the pianist Marie Pleyel at the French embassy. Back in France in March 1840, Nerval took over Gautier's column at La Presse. After publishing a third edition of Faust in July, including a preface and fragments of Second Faust, he traveled to Belgium in October. On 15 December Piquillo premiered in Brussels, where Nerval crossed paths with Jenny Colon and Marie Pleyel once again. After a first nervous breakdown on 23 February 1841 he was cared for at the Sainte-Colombe Borstal ("maison de correction"). On 1 March Jules Janin published an obituary for Nerval in the Journal des Débats. After a second nervous breakdown, Nerval was housed in Docteur Esprit Blanche's clinic in Montmartre, where he remained from March to November. On 22 December 1842 Nerval set off for the Near East, traveling to Alexandria, Cairo, Beirut, Constantinople, Malta and Naples. Back in Paris in 1843, he began to publish articles about his trip in 1844. His Journey to the Orient appeared in 1851. Between 1844 and 1847, Nerval traveled to Belgium, the Netherlands, to London, producing a significant amount of travel writing. At the same time, he wrote novellas and opera librettos and translated poems by his friend Heinrich Heine, publishing a selection of translations in 1848. His last years are spent in dire financial and emotional straits. Following his doctor Emile Blanche's advice, he tried to purge himself of his intense emotions in his writing. This is when he composed some of his best works. Why should a lobster be any more ridiculous than a dog? ...or a cat, or a gazelle, or a lion, or any other animal that one chooses to take for a walk? I have a liking for lobsters. They are peaceful, serious creatures. They know the secrets of the sea, they don't bark, and they don't gnaw upon one's monadic privacy like dogs do. And Goethe had an aversion to dogs, and he wasn't mad. 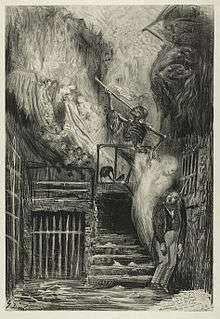 Increasingly poverty-stricken and disoriented, he committed suicide during the night of 26 January 1855, by hanging himself from the bar of a cellar window in the rue de la Vieille-Lanterne, a narrow lane in a squalid section of Paris. [lower-alpha 1] He left a brief note to his aunt: "Do not wait up for me this evening, for the night will be black and white." The poet Charles Baudelaire observed that Nerval had "delivered his soul in the darkest street that he could find." The discoverers of his body were puzzled by the fact that his hat was still on his head. The last pages of his manuscript for Aurélia ou le rêve et la vie were found in a pocket of his coat. After a religious ceremony at the Notre-Dame cathedral (which was granted despite his suicide because of his troubled mental state), he was buried in the Père Lachaise Cemetery in Paris, at the expense of his friends Théophile Gautier and Arsène Houssaye, who published Aurélia as a book later that year. The complete works of Gérard de Nerval are published in three volumes by Gallimard in the collection Bibliothèque de la Pléiade. In 1867, Nerval's friend Théophile Gautier (1811–1872) wrote a touching reminiscence of him, "La Vie de Gérard", which was included in Gautier's Portraits et Souvenirs Litéraires (1875). André Breton exemplifies the influence of Nerval's insistence on the significance of dreams on the Surrealist movement. Others influenced by Nerval's work include Marcel Proust, René Daumal, and Antonin Artaud. Umberto Eco in his Six Walks in the Fictional Woods calls Nerval's Sylvie a "masterpiece" and analysed it to demonstrate the use of temporal ambiguity. Henry Miller called Nerval an "extraordinary French poet" and included him among a group of exemplary translators:"[i]n English we have yet to produce a poet who is able to do for Rimbaud what Baudelaire did for Poe's verse, or Nerval for Faust, or Morel and Larbaud for Ulysses". Les Faux Saulniers (The Salt Smugglers, 1850) — published over several weeks in Le National, a daily newspaper. He later incorporated some of this material in Les Filles du Feu (in Angelique) and in Les Illuminés (in L'Abbé de Bucquoy). Voyage en Orient (1851) — an account of the author's voyages to Germany, Switzerland and Vienna in 1839 and 1840, and to Egypt and Turkey in 1843. Includes several pieces already published, including Les Amours de Vienne, which first appeared in the Revue de Paris in 1841. One of the author's major works. La Bohème Galante (1852) — a collection of short prose works and poems including some of the set he later called Odelettes. Dedicated and addressed to Arsène Houssaye. Les Nuits d'Octobre (1852) — a small collection of essays describing Paris at night. Lorely, souvenirs d'Allemagne (1852) — an account of his travels along the Rhine, also in Holland and Belgium. It includes the full-length play Léo Burckart, under the title "Scènes de la Vie Allemande". Les Illuminés (1852) — a collection of six biographical narratives in the form of novellas or essays. Sylvie (1853) — described by Nerval as "un petit roman" ("a small novel"), it is the most celebrated of his works. Petits Châteaux de Bohême (1853) — a collection of prose works and poetry, including the short play Corilla, which was subsequently included in Les Filles du Feu, and the Odelettes, and several of the sonnets later published as Les Chimères. Pandora (1854) — another Fille du Feu, not finished in time for inclusion in that volume, written in the style of Sylvie and set in Vienna. Also known as La Pandora, often subtitled Suite des Amours de Vienne. Aurélia ou le rêve et la vie (1855, posthumously) — a fantasy-ridden interior autobiography. Promenades et Souvenirs (1854–1855) — a collection of eight essays after the manner of Les Nuits d'Octobre, describing the Saint-Germain neighborhood of the author's childhood and youth. The last, "Chantilly", includes an essay-portrait similar to those in Les Filles du feu. ↑ The street existed only a few months longer. The area had been scheduled for demolition in June 1854, and that work began in the spring of 1855. The site of Nerval's suicide is now occupied by the Théâtre de la Ville. 1 2 Pierre Petitfils, Nerval, biographie, p. 15. ↑ Richer, Jean (1970). Nerval par les témoins de sa vie. éditions Minard. p. 73. ISBN 0-320-05499-3. ↑ Conversations of Goethe with Eckermann, Trans. John Oxenford, 1906. Jan 3, 1830 entry Archived 25 March 2016 at the Wayback Machine..
↑ Kelly, Thomas Forrest (2000). First Nights: Five Musical Premieres. Yale University Press. p. 190. Retrieved 6 March 2016. ↑ "Gérard de NERVAL" (in French). 28 August 2003. Retrieved 17 June 2016. ↑ For example, see Christine Bomboir, Les Lettres d'amour de Nerval : mythe ou réalité ?, p. 93–94. ↑ Horton, Scott (12 October 2008). "Nerval: A Man and His Lobster". Harper's Magazine. Retrieved 22 January 2010. ↑ Gautier, Théophile (1875). Portraits et Souvenirs Littéraires. Paris: Charpentier. ↑ Carmona, Michel (2002). Haussmann: His Life and Times and the Making of Modern Paris. Chicago: Ivan R. Dee. pp. 249–51. ISBN 1-56663-427-X. ↑ Sieburth, Richard (1999). Gérard de Nerval: Selected Writings. London: Penguin Group. p. xxxi. ↑ "Le Catalogue: Gerard de Nerval". Retrieved 1 September 2015. ↑ Miller, Henry, The Time of the Assassins, A Study of Rimbaud, New York 1962, p. vi and vii. Œuvres complètes. 3 vols. Eds. Jean Guillaume & Claude Pichois. Paris: La Pléiade-Gallimard, 1984. Print. Album Nerval. Eds. Éric Buffetaud and Claude Pichois. Paris: La Pléiade-Gallimard, 1993. ISBN 2070112829. Gautier, Théophile. (1900). "Gérard de Nerval." In: The Complete Works of Théophile Gautier, Vol. VIII. London: The Athenæum Press, pp. 96–116. Jones, Robert Emmet (1974). Gerard de Nerval. New York: Twayne Publishers. Sowerby, Benn. The disinherited; the life of Gérard de Nerval, 1808–1855. New York: New York University Press, 1974. Print. Ahearn, Edward J. "Visionary Insanity: Nerval's Aurélia." Visionary Fictions: Apocalyptic Writing from Blake to the Modern Age. New Haven: Yale University Press, 1996. Print. Jeanneret, Michel. La lettre perdue: Ecriture et folie dans l’œuvre de Nerval. Paris: Flammarion, 1978. Print. Gordon, Rae Beth (2014). "The Enchanted Hand: Schlegel’s Arabesque in Nerval." In: Ornament, Fantasy, and Desire in Nineteenth-Century French Literature. Princeton: Princeton University Press. Rhodes, Solomon A. (1951). Gérard de Nerval, 1808–1855: Poet, Traveler, Dreamer. New York: Philosophical Library. Symons, Arthur (1919). "Gérard de Nerval." In: The Symbolist Movement in Literature. New York: E.P. Dutton & Company, pp. 69–95. Lang, Andrew (1892). "Gérard de Nerval." In: Letters on Literature. London and New York: Longmans, Green & Co., pp. 147–156. Blackman, Maurice (1986–87). "Byron and the First Poem of Gérard de Nerval," Nineteenth-Century French Studies, Vol. XV, No. 1/2, pp. 94–107. Bray, Patrick M. (2006). "Lost in the Fold: Space and Subjectivity in Gérard de Nerval's 'Généalogie' and Sylvie," French Forum, Vol. XXXI, No. 2, pp. 35–51. Carroll, Robert C. (1976). "Illusion and Identity: Gérard de Nerval and Rétif's 'Sara'," Studies in Romanticism, Vol. XV, No. 1, pp. 59–80. Carroll, Robert C. (1976). "Gérard de Nerval: Prodigal Son of History," Nineteenth-Century French Studies, Vol. IV, No. 3, pp. 263–273. DuBruck, Alfred (1974–1975). "Nerval and Dumas in Germany," Nineteenth-Century French Studies, Vol. III, No. 1/2, pp. 58–64. Duckworth, Colin (1965). "Eugène Scribe and Gérard de Nerval 'Celui Qui Tient la Corde Nous Étrangle'," The Modern Language Review, Vol. LX, No. 1, pp. 32–40. Knapp, Bettina L. (1974–75). "Gérard de Nerval's 'Isis' and the Cult of the Madonna," Nineteenth-Century French Studies, Vol. III, No. 1/2, pp. 65–79. Knapp, Bettina L. (1976). "Gérard de Nerval: The Queen of Sheba and the Occult," Nineteenth-Century French Studies, Vol. IV, No. 3, pp. 244–257. Lang, Andrew (1873). "Gérard de Nerval, 1810–1855," Fraser's Magazine, Vol. VII, pp. 559–566. Mauris, Maurice (1880). "Gérard de Nerval." In: French Men of Letters. New York: D. Appleton and Company, pp. 129–150. Moon, H. Kay (1965). "Gerard de Nerval: A Reappraisal," Brigham Young University Studies, Vol. VII, No. 1, pp. 40–52. Rhodes, Solomon A. (1938). "Poetical Affiliations of Gerard de Nerval," PMLA, Vol. LIII, No. 4, pp. 1157–1171. Rhodes, Solomon A. (1949). "The Friendship between Gérard de Nerval and Heinrich Heine," The French Review, Vol. XXIII, No. 1, pp. 18–27. Rinsler, Norma (1963). "Gérard de Nerval, Fire and Ice," The Modern Language Review, Vol. LVIII, No. 4, pp. 495–499. Rinsler, Norma (1963). "Gérard de Nerval's Celestial City and the Chain of Souls," Studies in Romanticism, Vol. II, No. 2, pp. 87–106. Smith, Garnet (1889). "Gérard de Nerval," The Gentleman's Magazine, Vol. CCLXVI, pp. 285–296. Warren, Rosanna (1983). "The 'Last Madness' of Gérard de Nerval," The Georgia Review, Vol. XXXVII, No. 1, pp. 131–138. Wikimedia Commons has media related to Gérard de Nerval.